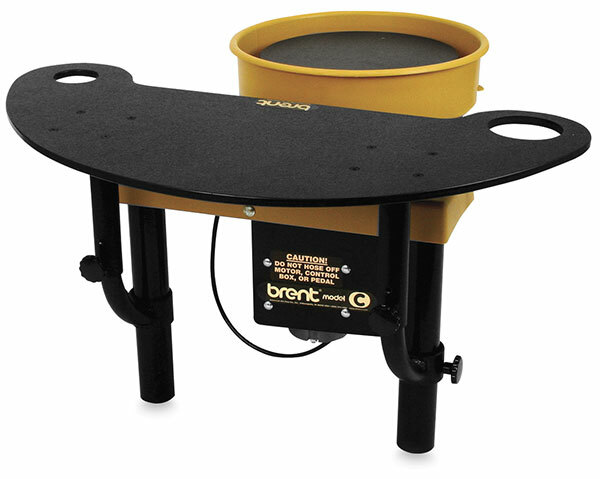 Add versatility and convenience to your Brent Model B, C, CXC, EX or IE/IE-X pottery wheels manufactured after January 2009.The Brent WorkStation allows you to store clay, modeling tools, brushes, and other supplies on the surface or in cup holders to keep them within arm's reach. The Brent WorkStation is 1/3" (8 mm) thick and made from the same rigid, easy-to-clean material as the Amaco Plasti-Bat. The one-piece curved table attaches to the front legs of the wheel with four steel supports (two per side). The table height can be adjusted by using one or both knobs on each side at the same time. Simply loosen the front knobs, the side knobs (or all four), raise or lower the table to the desired height, then tighten to secure. Also included are two storage cup holders, measuring 2-3/16" (6 cm) and 4-3/16" (11 cm) in diameter.